July 4th at 9:25 p.m. - 9:35 p.m.
Fireworks are immediately following the 9:00pm evening performance of the "Neighborhood Street Party" parade. Sesame Place at 100 Sesame Rd. 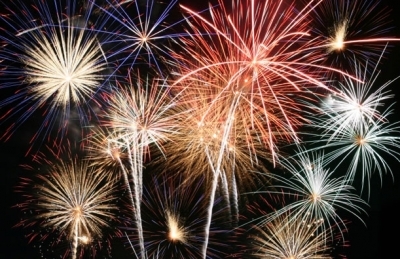 Fireworks begin at 9:35 p.m.
July 4th (Rain date: July 5th), 9-9:15 p.m. Friendship Field at the corner of Fillmore St. and Franklin Ave.
Sun Valley High School on Pancoast Ave.
July 4th at 9:00 p.m.
Penn Wood High School field, 100 Green Ave.
July 4th at 9:20 p.m. / Gates open at 5:30 p.m.
July 4th, approx. 9:15 p.m.
July 4th at 9:20 p.m.
June 30th at 9:30 p.m.
July 3rd, Fireworks and Celebration at 6 p.m.
July 3rd at 9:30 p.m.
July 2nd at 9:30 p.m.
July 4th at 9:15 p.m.
July 3rd at 9:00 p.m.
July 4th at 9 p.m.
July 4th at 10 p.m.